We have decided to celebrate 70 years of Vespa with a monthly chronicle of the History of Vespa from 1946 to 2016! This month we are starting with the customised Vespa Ferrari ET4 150 in 2001 to the technological Vespa S50 – LX50 4V in 2009. Each month, we will post up a little history and pop it in our newsletter so you can find out a little more of the history of this iconic brand. This model was thought as a homage to the Ferrari team for the victory of the Formula 1 World Championship in 2000. The vehicle was customised with the names of Montezemolo, Todt, Schumacher and Barrichello, it had a Ferrari red livery with leather saddle which was of the same material used to upholster the inside of a Ferrari. Fifty years after the launch of the Vespa GS (Gran Sport), the first sport scooter in history and still a sought after treasure for collectors and fans, Vespa GTS 250 i.e. renews the GS blend of speed and style to become the fastest, most powerful and most high-tech Vespa. From November 2011, Vespa GTS “grew” to the 300 class with an avant-garde, extremely powerful four-valve, liquid cooled engine with electronic injection. Vespa GTS is stopped with a superb double disc braking system. This is the gift that Vespa was determined to give its fans to celebrate the company’s sixtieth anniversary. With its prestigious materials and exclusive finish, this unique limited edition is made in a series of only 999 units, and is destined to become one of the milestones in Vespa’s long history. All the character of the sporty “Vespino” of yesteryear is revived by the brand new Vespa S. This fascinating blend of styles and memories keeps the soul of the youngest and most sporting of all Vespas alive in the present day. The Vespa S inherits its rigorously minimalist looks from legendary models of the 1970s like the 50 Special and Vespa Primavera. The new 50cc, four stroke, four valve engine leads to the rediscovery of an engine size which is “legendary” in Vespa history. With new 4 valve timing, this brand new and feisty powerplant has nothing to envy of its two-stroke counterparts (at 4.35 hp it is the most powerful 50 cc four-stroke on the market), yet its consumption and emission figures remain those of a typical four stroke. With this new engine, Vespa reconfirms a technological supremacy that has stood for over six decades. 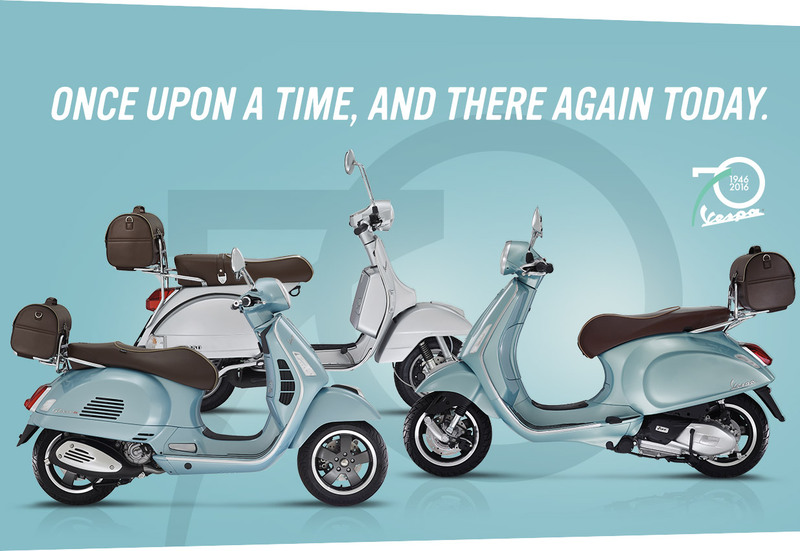 You can check out our range of Vespa models by clicking here and for more information on the Vespa 70° Anniversary, click here. Vespa, 70 years on the road… and it seems it was born just yesterday!